Sylvia de Swaan was born in Romania and has lived and worked in Mexico, Europe and the United States. She is a prolific and accomplished artist who has produced several significant bodies of work. Her long-term projects explore the nature of identity in relation to place, memory, conviction and experience. “Where Will You Spend Eternity?” a book of color photographs made in a post-industrial city, adds another chapter to her travelogues. The book has several essays and poems by others, which further elucidates its content. These attentive and intelligent images quietly picture the demise of the American Dream. Utica, a city in central New York State was built on the ruins of the Mohawk tribe. Famous for corruption and violence, it is now populated by drug dealers, Burmese monks, other refugees, and a population of entrenched citizens willing to stay or unable to move away. de Swaan has photographed life here in sad and ironic images. Utica once housed a flourishing General Electric plant. Now it seems to have an abundance of boarded-up houses, chain-link fences and an overall sense of hopelessness. We are shown the remnants and remains of a once thriving town that has faded off the map, or at very least the radar of America. The photographs are carefully composed and captioned. Many of the titles simply spell out particular streets - Eagle Street, Lincoln Avenue, Genesee Street, Schuyler Street, Columbia Street, Washington Court - names that refer to civic history. The American flag is everywhere - on a giant oak in a yard, tied with yellow ribbons; on the sides and backs of USPS trucks; on the surface of a white building on Broad Street; on a garage sign on Schuyler Street; on the painted mural of a 9-11 memorial. We see it flying over a house with a hand-lettered sign “Brian Be Safe in Iraq” at its base; and again in the front yard of a light blue house with a giant blowup Christmas dog, where a light snow is falling. Upstate New York is cold - it snows often. 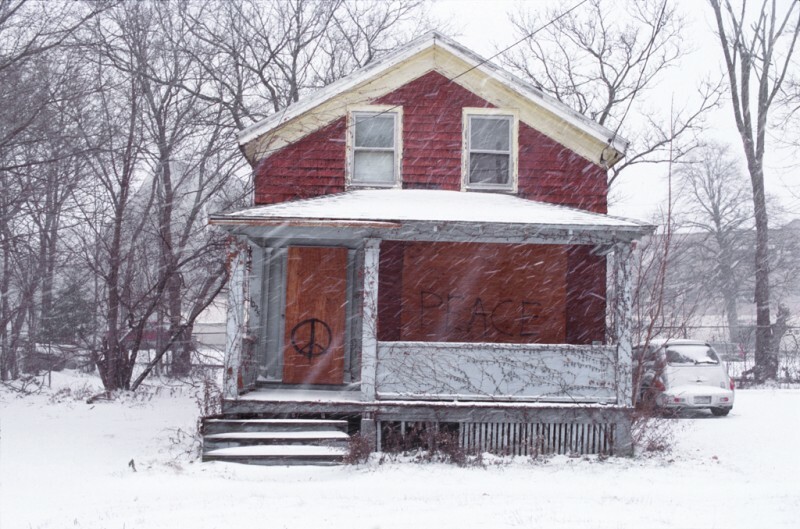 de Swaan shows us the motion and the patterns of it - outside a boarded-up red house spray-painted with peace signs on Fay Street, or piled on a roof and a religious statue on Main Street. She points out snow on the ground under an ice machine, and stamped with footprints next to a clothesline of frozen garments on Sauquiot Street. Documenting pictures within her pictures, de Swaan comments wryly - large trucks are flanked with photos of happy people in affordable spas, attractive women draped across mattresses. The back cover photo “Always Waving” is a life-size three-dimensional image of a woman on the side of a tractor-trailer. Signs are ubiquitous too - hand-drawn peace signs, murals and graffiti on sides of buildings; commercially printed signs full of paranoia - “Beware of Guard Dogs”, “You Are Under Surveillance”, and the sardonic McDonald’s billboard proclaiming “Wake Up Happy”. In addition to literal notices, there are the physical traces of abandonment - toys on a pile of rubble, a couch minus its cushions on the sidewalk, boarded-up homes and stores marred by graffiti; weeds; fallen fences, a chain-linked factory. Yet amid this lonely devastation de Swaan depicts a few people - many of them small in the frame. They are waiting in the almost-empty train station, or walking on the street. Several images are taken from inside her car. Closer interactions reveal the humanity of individuals - two girls with a dog; a trio of young men protesting the economy. And the melancholy yet joyous “Rainbow Makes Music” in which an accordion player, face uplifted, sings into the falling snow. Life has stopped here, but a few survivors go on. de Swaan celebrates what remains. She also shows us the way out, via the train tracks with which she cleverly opens and closes her book.